Once the scourge of rural gardens, the burgeoning deer population has moved to more urban areas thanks to civilization encroaching on their natural habitat combined with a lack of local natural predators. Neighborhoods that previously had to worry only about the occasional groundhog or rabbit suddenly find themselves battling a new grazer: deer. While they might look picturesque on the lawn, deer can wipe out a flower bed or vegetable garden in no time. However, there are a few tricks gardeners can employ to protect their gardens, particularly with some smart landscaping. Deer rely on their sense of smell for feeding, so incorporating fragrant plants is one method of deterring them. Flowering herbs such as lavender, rosemary, catnip, garlic, chives and oregano are among the plants from which deer may steer clear. Mint, while also an excellent deterrent, is incredibly invasive and should be grown in pots if you want to contain it. Trees and shrubs that deer tend to avoid include viburnum, hawthorn, currant and gooseberry bushes, boxwoods, lilacs, hollies and smoke trees. While most herbs prefer a spring planting, shrubs and trees do best when planted in the fall, when the warm days and cool nights help establish plant roots long before the punishing heat of summer. In addition to avoiding aromatic plants, deer tend to avoid fuzzy, spiny and bitter plants. Lamb’s ear, yarrow, bee balm, echinacea and poppies are among the perennials deer tend to pass up. Instead of planting the deer delicacy of tulip bulbs this fall, look for bulbs deer don’t care for; the list is longer than you think and makes for a garden that blooms for months. Daffodils, allium, fritillaria, hyacinth and bluebells are among the list of fall-planting bulbs that deer don’t favor. Another excellent addition to any garden, the hellebore, also known as the Lenten Rose, is typically not attractive to deer. A hardy, shade-loving, evergreen perennial, hellebores bloom in late winter and early spring. Their blooms will last for months on end, withstanding the deep freezes and snows of late winter well into the warm blasts of late spring. Plant by seed or clumps in the fall, keeping in mind that it can take a few years for hellebores to establish themselves enough to bloom. Once established, they will begin to send out baby plants in the form of clumps into the surrounding landscape. Other methods of deterring deer involve odor and noisemaking. Fish meal and predator urine sprays work well, but their scent can cover a wider area than just the plants you are looking to protect. There are a number of homemade options that may not be as offensive to humans—such as hanging a fragrant bar of soap, or creating a number of DIY sprays using hot pepper or garlic. Any sort of spray utilized will have to be reapplied often—generally every few days, particularly after any rain. Deer adjust to smells, so experts recommend changing up whatever scents you are using every few weeks to avoid the deer becoming complacent about your methods. Motion-sensor lights or sprinklers as well as radios can create a diversion, but neighbors in close quarters may not appreciate these efforts. Wind chimes or other garden ornaments that move can scare deer off while not being as intrusive to the neighbors. If you do have plantings you simply cannot sacrifice that deer have trouble resisting, planting near a house or other structure can help to deter their snacking. 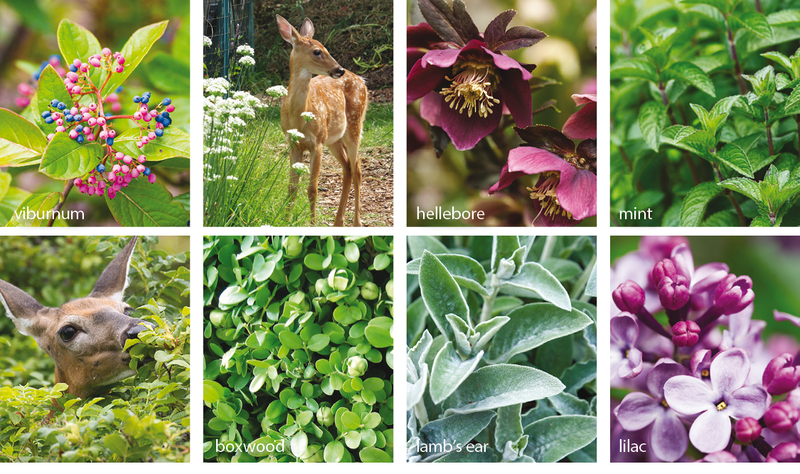 Consider creating a border with plants that deer don’t care for, particularly aromatic ones, that can help distract deer and protect the plants they do like. Of course, if deer get hungry enough, they will eat anything, regardless of how much they don’t care for it. And if you have a vegetable garden in an area where deer are free to roam, a fence is the only way to protect your plants. Deer can clear an 8-foot wall, so it is recommended that any fence installed, other than a stockade fence, be at least that height. Because deer don’t tend to jump where they can’t see the other side, lower stockade fence heights—6 feet tall—tend to work well. Deer mesh utilized in a fence or over individual plants is also effective. Using a few rows of fishing line—small and barely perceivable to the eye—is another great way to create a physical deterrent. For a more inexpensive fence, the transparent string can be used to create a vertical mesh between larger strands of wire. Fall months also bring what is known as the rut: deer mating season. Males will rub their antlers on trees to help mark their territory, potentially severely damaging them in the process. To help protect vulnerable tree trunks, wrap a plastic tube (often sold as “tree tubes” or “seedling protectors”) or wire cylinder around the trunk to a height of 4 feet to deter bucks. The best time to start scaring deer from your property is as soon as you see them. 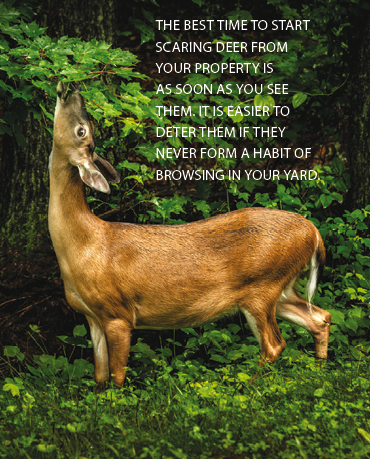 It is easier to deter them if they never form a habit of browsing in your yard. If they are already established, you can still take steps to minimize their effect. To determine the most effective method for your yard, consider the economic impact of the damage the deer can impart. How much time and money are you willing to spend to reduce deer damage? This, along with any local covenants and lot size, can help you determine the best combination of methods for steering deer away from your yard, whether it be fencing, noise and odor repellents or just changing your landscape to plants the deer don’t care for. It often takes several methods combined to keep the deer at bay. There are some gardeners who go ahead and cede a portion of their yard to the deer, creating boundaries with plants and fencing around what they wish to protect while letting their four-legged visitors feast elsewhere. Whatever methods you choose, be sure to steer clear of anything poisonous to humans and other living creatures, particularly if you have pets. Pets are actually another great deterrent to deer: The more time Fido spends outside, the less likely deer will want to set foot in your yard. One thing is for sure in the battle of gardeners versus deer: Deer aren’t surrendering anytime soon.